Composer, flugelhornist and trumpeter Gordon James, is a seasoned performer and bandleader. James has a unique style of music projecting a special appeal to the listener, blending the worlds of Jazz, Latin, R&B, Pop and hip hop music. James states, "my music is both funky and lyrical; the arrangements are hip and polished and the flugelhorn and muted trumpet are perfect for conveying the passion of my compositions". A graduate of The Interlochen Arts Academy and The Hartt College Of Music, Mr. James has gone on to study and perform with such artists as trumpeter Ted Curson, a Charles Mingus alumni, saxophonist Eric Kloss, Johnny Guitar Watson, Chuck Loeb, Bob Baldwin, James Lloyd, Gil Parris, Josh Dion, cellist David Darling and saxophonist Paul Winter. 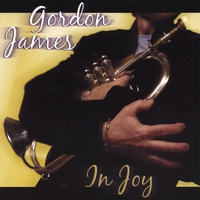 In 1995 Gordon James released his first CD "Candlelight Love." The CD features world renowned guitarist Vic Juris in a rare contemporary jazz setting and percussionist Manolo Badrena of Weather Report and Spyro Gyra. "Candlelight Love received much attention here in the US and in England. Jonathan Widran of Jazziz Magazine said of the album, "James knows how to whip his band into exotic colors and stirs up some highly amiable cool craziness." Gordon's second CD received rave reviews and gained attention in the US, Europe, South America and Australia. His original track "Shades of Brown" has been included on the Jan. 2000 compilation CD for Jazz fm, London's premiere smooth jazz station. Fred Scott of Contemporary Jazz.com states, "this recording is bursting with hip grooves and funky cadences and Jame's versatility on his instrument is brilliant. His talent should be discovered by the world." The CD features keyboardist James Lloyd from the acclaimed jazz group Pieces of a Dream and offers a colorful set that crosses many musical boundaries and should appeal to a wide audience. Mr. James went on to release the beautiful and mellow "After Hours" CD which featured such notables as Chuck Loeb and Slide Hampton. Most recently he has teamed up with producers James Lloyd and Bob Baldwin for his fourth CD "In Joy" which will be released later in 2007. In 1995 James formed the Gordon James Band which has appeared with some of contemporary jazz's greatest. Opening for such artists as Roy Ayres, Angela Bofill, Bobby Caldwell, Alex Bugnon, Pieces of A Dream, Chuck Loeb, Cassandra Wilson and others - Gordon James is being recognized as an exciting new talent. The band has worked such venues as The Newark Jazz Festival, Asbury Park Jazz Fest, Greater Hartford Jazz Festival, Bethlehem Musikfest, Red Bank Jazz In The Park, Red Bank Jazz & Blues Festival, The Original Cool Cruise and has also appeared on the NJ Network and done shows for Suburban, Monmouth and Comcast Cablevisions. Most recently James and group performed at the Jazz Masters on the Bay festival in Norfolk, VA with Pieces of a Dream, Marcus Johnson, Bob Baldwin, Chuck Loeb and Phil Perry. Gordon was not only a huge hit with his group but also performed two songs with Bob Baldwin and Chuck Loeb on their set. The intriguing sounds of Gordon James are a refreshing addition to the world of contemporary jazz. He is definitely ready to break out here in the 21st century.